The answer is written in turkey blood. Thanksgiving is upon us, and soon enough the turkeys that were violently killed for feasting will give way to an even more savage war: The family fight over white meat or dark meat. The difference between the two types, incidentally, comes down to the blood spilled from those turkey bits. To understand how the structure and composition of meat affect its taste, nutrition, taste and cooking time, it’s important to talk about what actually creates differences in its color. It all comes down to a protein called myoglobin, which is more abundant in muscles that require a lot of oxygen to do more work (like the muscles in turkey legs). This protein, which is similar to hemoglobin, binds with oxygen and delivers it to muscles that need it for sustained activity. Myoglobin also happens to contain iron, which oxidizes and darkens the meat. A steak, for instance, contains a lot of myoglobin and cooking it oxidizes a lot of the iron, leading to brown meat. Farmed turkeys don’t use their flight muscles, so their breast meat is white and devoid of myoglobin and its darkening iron atoms. Dark meat's color is all thanks to this guy: myoglobin. Dark meat is nutritionally different, too. According to the U.S. Department of Agriculture, three ounces of turkey breast (white meat) contains 160 calories and six grams of fat. A thigh (dark meat) contains 190 calories and 10 grams of fat. The difference isn’t huge, and both cuts of turkey are a little bit better for you than the equivalent cuts of chicken. Dark meat does have more iron, zinc, folate, and vitamins B6 and B12 than white meat. Ultimately, the differences aren’t huge, and if you’re really worried about calories, you can always cut back on the pie. Because dark meat is found mostly on the turkey’s thighs and drumsticks, it’s less exposed in the oven and takes a bit longer to cook than the thinner breast meat. One solution? Stick your bird in the oven upside-down and flip it in the middle of the cooking time. 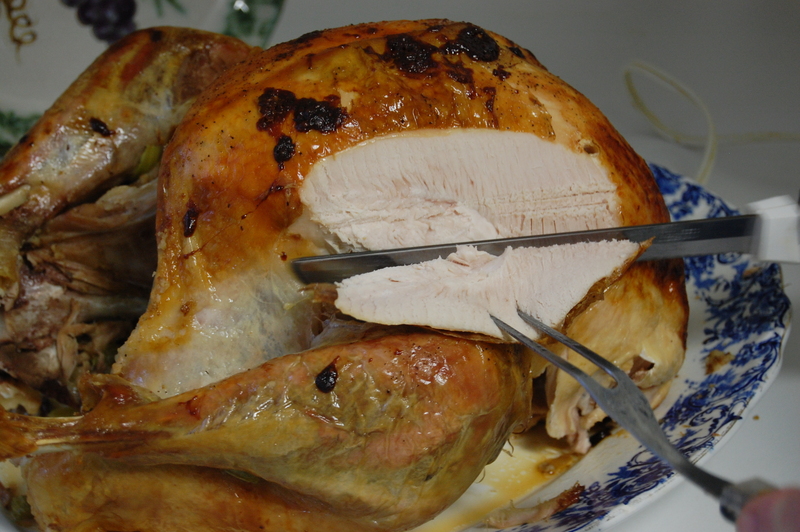 You can also use foil to protect the breast meat from drying out as the dark meat finishes cooking. Thanks to its slightly higher fat content, dark meat is a little juicier than white meat and tends to make for especially flavorful leftovers. Which means you can eat plenty on Thanksgiving and the days after — just think of all the extra iron you’re getting.